Project obstacles and solutions: The dam on Fall Creek at the intersection of Keystone Avenue and Fall Creek Parkway was originally built in the late 19th century. In subsequent decades, it was repaired by adding concrete on top of the original structure. Citizens Energy Group put out bids to replace the aging dam. Thieneman Construction was chosen to tear out the old structure and build a new dam. Fall Creek is a fast moving waterway at this juncture. Part of the challenge was to divert enough water away from the work site so that it was safe for workers and equipment. Thieneman studied water flow charts and was set to start the project during the summer of 2012, when the water would be at its lowest levels. This appeared to be a great decision when the drought conditions reduced the amount of water flowing through the creek to below average levels. However, there were delays and the project was not started until early 2013. During the late winter and early spring months, the creek is at its highest water levels. Thienenman constructed diversion pipes that channeled water away from the new dam. They then created a roadway in the shallows with compacted stone and steel road plates, just wide enough for equipment and material deliveries to be made in the water. Thieneman contacted IMI to supply 1,500 yards of concrete for this project. 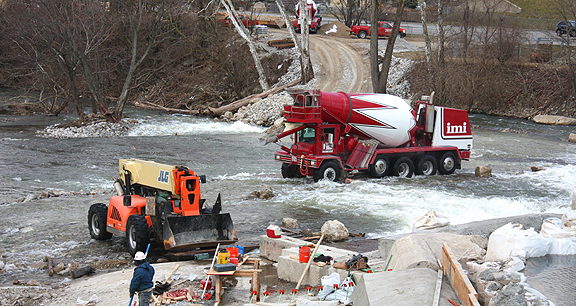 This required the mixer trucks to cross the creek one at a time to deliver concrete. When the water level was deemed to be too high, the project was put on hold. When the water was at an acceptable level for safe crossing, IMI was ready with concrete up to 200 yards per pour. Timing delivery so that schedules remain on time is always important. IMI dispatchers and drivers worked together to make sure that the flow of concrete was continuous to the site and that the amphibious nature of delivery was accounted for in spacing of trucks.